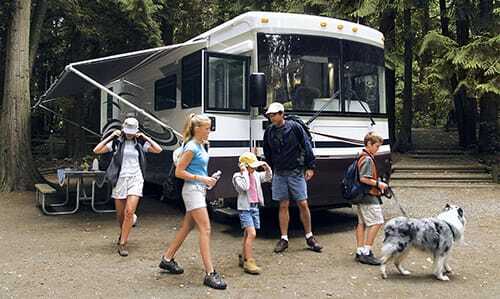 There are various factors that determine which RV is right for you. For new RVers, this choice can be an overwhelming decision. At Camping World, we want to make this process as easy as possible. By offering a vast selection of RVs, from high-end class A diesel motorhomes to bunkhouse travel trailers designed for a modern family to four season truck campers ideal for hunting and fishing, we are sure to have the perfect RV for you. Travel trailers have a variety of floorplans to choose from. 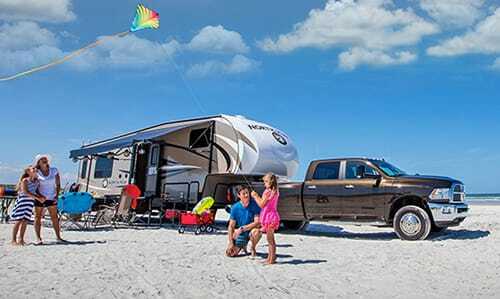 These RVs range from the family friendly bunkhouse model that can sleep a small army, to the lightweight couple's model perfect for weekend getaways for two. Travel trailers are made with innovative options such as murphy beds, outside kitchens, and four season insulation. 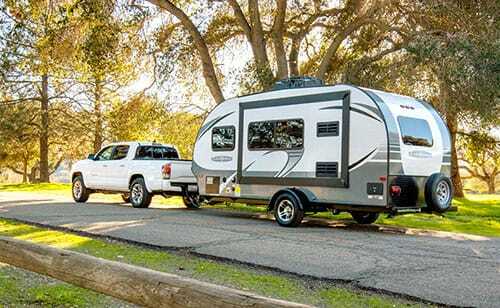 Some travel trailers can be towed with a small to mid-range SUV. 5th Wheels are easy to tow, feature many home-like amenities, and offer a residential feel. Their fully equipped kitchens often have a residential refrigerator, microwave, stove-top, oven, ample pantry space, and some floorplans even have islands that provide extra counter space. The bedroom is usually in the front of the coach, near the bathroom, and features a large wardrobe. Most 5th wheels have washer & dryer hook-ups in the bedroom. 5th wheels are great options for growing families as the bunkhouse models offer plenty of space for the children to sleep, some even have a second entertainment center and bathroom just for the bunkhouse. 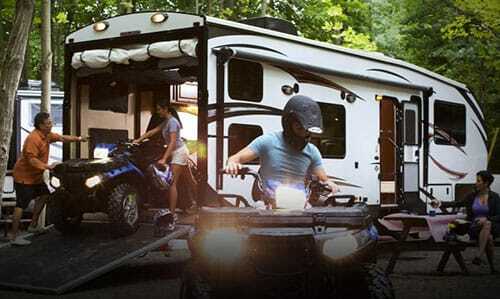 Toy Haulers are perfect for the outdoor sports enthusiast who wants to take all of their toys with them on the road. These RVs feature a rear garage where you can store motorcycles, ATVs, bikes, and other vehicles. We offer Toy Haulers 5th Wheels or Toy Hauler Travel Trailers. The 5th wheel option provides a separate living area from the garage and has more residential features, like a full kitchen, master bedroom, and extra sleeping space for guests. The travel trailer is a more compact option, combining living space, kitchen and garage into one area, but is also lighter and therefore easier to tow. 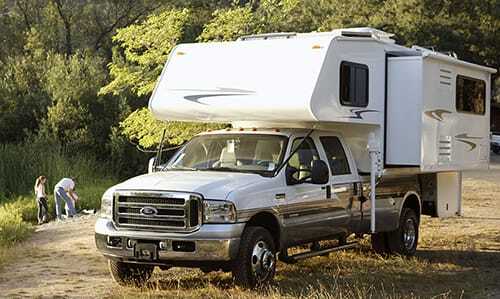 Truck Campers sit in the bed of a truck and offer a great amount of flexibility and freedom on the road. These RVs often have a bed, kitchenette, wet or dry bath, and a dinette or sofa, offering plenty of amenties in a compact space. 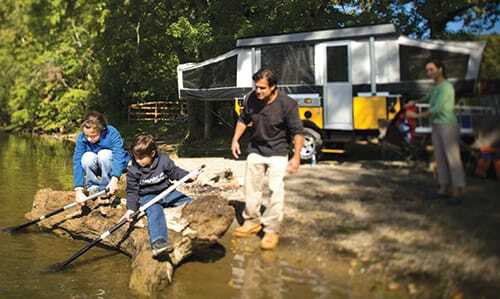 Truck campers are popular among outdoors entusiasts because they can take them into the woods for hunting or fishing and not have to worry about towing anything behind them. 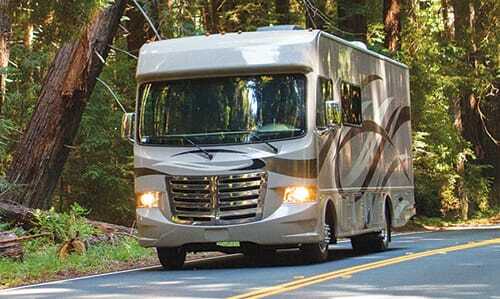 Class A gas motorhomes provide a comfortable home-like experience while on the road. These coaches are equipped with many luxurious residential amenities, but at lower price point than its diesel counterpart. With class A gas motorhomes, you will get plenty of basement storage that is easily accessed through the slam-latch baggage doors that line the perimeter of the coach's exterior. These motorhomes have enough power to tow a car, small boat, or motorcycle. Class A diesel motorhomes provide the ultimate luxury travel experience with elegant features that will make you feel like you are staying in a five star hotel. Class A diesel motorhomes are also known as diesel pushers becuase the engine is located in the rear of the coach, providing more power to tow a car, boat, or cargo trailer. These motorhomes are a popular choice for full-time RVers as they provide many household amenities such as a dishwasher, washer & dryer, residential refrigerator, premium mattress, and usually are equipped with more than one bathroom. 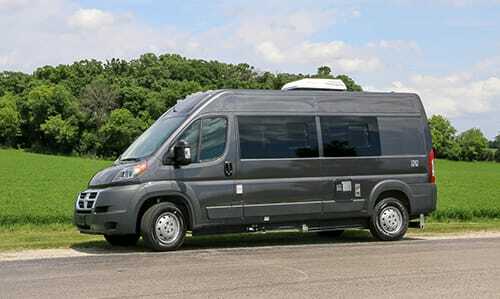 Class B motorhomes are the perfect touring coach. They offer great flexibilty and luxury for vacation and are even popular for full-time living because of their solid construction and dependability. These coaches feature a rear power sofa that lowers down into a king size bed, providing comfortable sleeping arrangements for two. The bathroom and galley offer practical solutions & innovative features that make the compact space very usable. Class C motorhomes offer fully loaded features with plenty of room for the family. 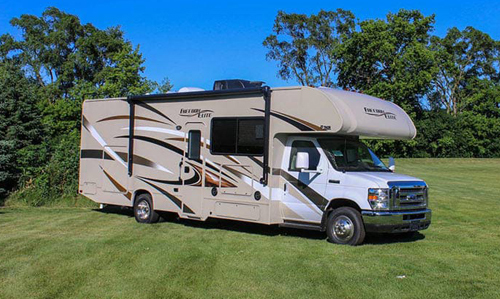 The class C motorhome has ample sleeping space and generally is equipped with a rear queen bed, a double bed over the cab, and a sleeper dinette and/or sleeper sofa. These motorhomes provide a great amount of storage in their rear trunk and interior pantry spaces, overhead cabinets, and wardrobes. These RV's have enough power to tow along a car and are very easy to drive. Class C motorhomes are a popular choice for long road trips, family vacations, and make for a great couple's model as well.